He has grown so much in 2 years. And my baking skills have...not grown. 😂 Even with a little helper this year!! Savannah Guthrie celebrated her son Charley's second birthday over the weekend with a homemade chocolate cake. 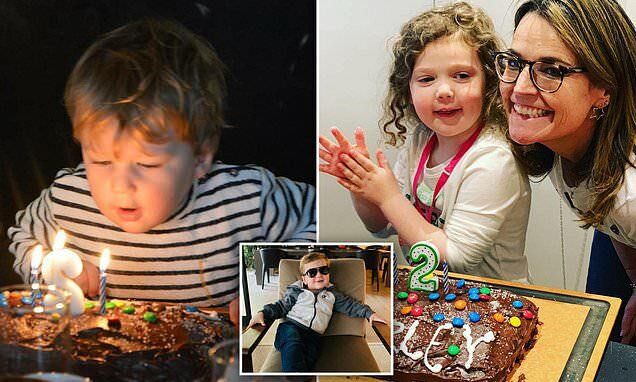 The 46-year-old mom took to Instagram on Saturday to pay tribute to her only son while sharing heartwarming pictures of her little boy and her four-year-old daughter, Vale, who helped make her little brother's birthday cake. 'He has grown so much in 2 years. And my backing skills have...not grown. Even with a little helper this year!!' she joked in the caption. The series of photos show little Charley sitting a chair at the dinner table while his mom brings out his cake. In one snapshot, he is happily putting his finger in the chocolate icing after his mom placed the cake in front of him. Savannah also struck a pose with her daughter in front of the cake they made, which featured 'Charley' written in white icing and a sprinkling of M&M's. Savannah's husband, Mike Feldman, also shared photos of their son on Instagram in honor of his big day. In the sweet snapshots, Charley can be seen leaning over his cake and blowing out the candles. 'My little buddy turned 2 today. Happy Birthday, Charley!' Mike wrote.